SMWD Logo is composed of a leaf and water wave wherein from the leaf comes the water wave and then the water goes back to the leaf once again. The leaf represents the environment and water wave represents our water supply. It shows that we get our water supply from our environment and in return, we take care of our environment by protecting the water resources. 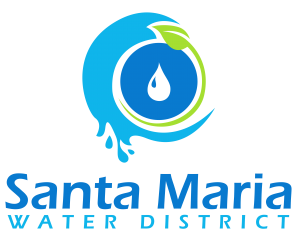 The water drop on the center represents the whole Municipality of Santa Maria, and the circle that surrounds it shows the adequate, reliable and potable water supply that Santa Maria Water District can provide to its concessionaires. The logo may also be pictured as the image of an eye, an eye that will serve as our instrument in rendering excellent and responsive customer service with the highest degree of professionalism and competence as a world-class water supply and sewerage service provider. To be a world class water supply and sewerage service provider. Protect and preserve the environment for sustainable community development. The original water system of Santa Maria, Bulacan was constructed in 1931 under Mayor Agustin Morales and was managed and operated by the defunct National Waterworks and Sewerage Authority (NAWASA). With the dissolution of the latter in 1971, management was turned over to the local government. However, the water system could not be maintained and operated efficiently due to lack of funds. To address this predicament, the Santa Maria Water District (SWMD) was formed on September 26, 1986 through Sangguniang Bayan Resolution No. 12 Series of 1986 for the purpose of: (1) acquiring, installing, maintaining, and operating water supply and distribution systems for domestic, industrial, municipal and agricultural uses of residents and lands within the boundaries; (2) providing, maintaining and operating wastewater collection, treatment and disposal facilities; and (3) conducting such other functions and operations incidental to water resource development, management, utilization and disposal within such district. With the formation of SMWD, It fully took over the operations and management of the water supply system from the municipal government in accordance with the Presidential Decree No. 198 (as amended by P.D. No. 768, 1479 and 9286) also known as the Provincial Water Utilities Act of 1973. A total of 241 concessionaires, three (3) production wells at Dulong Bayan, Macaiban and Villarica (the third well became idle due to low water pressure on December 1994) and one (1) concrete reservoir at Gulod, Poblacion were turned over to the SMWD. On September 28, 1987, the Local Water Utilities Administration (LWUA) issued the Conditional Certificate of Conformance (CCC) No. 310 enabling financial, technical and regulatory services for SMWD and it entitled the SMWD to all the rights and privileges provided under P.D. 198, as amended. Before 2002, SMWD could only provide water services for 18 hours a day. However, after the well drilling at Guyong in 2002, which was funded by the Landbank of the Philippines (LBP), and the well drilling at Villarica which was constructed through internally generated funds, the SMWD was able to supply water service 24 hours a day, seven (7) days a week. The present water supply system of the Municipality of Santa Maria is being operated and maintained by the Santa Maria Water District. The water district derives its water supply from the ground water through twenty two (22) deep wells provided with pumping facilities where water is delivered to the consumers both by gravity and by direct pumping, Others not served by the water district and Rural Water Service Association get their water form public and private wells. SMWD has four (4) reservoirs with a total capacity of 585 cu. m. of 154,540.65 gallons (Gulod concrete tank – 175 cu. m.; Sta. Clara overhead tank – 111 cu. m. ; Garden Village overhead tank – 209 cu. m.); and Glendale – 90 cu. m. While the total existing distribution pipelines is at 189,919.7 LM and the total existing production wells capacity is 282.34 liters per second or 4,475.19 gallons per minute. Now under the guidance of General Manager Engr. Carlos N. Santos Jr. and the Board of Directors, the Santa Maria Water District is the main provider of safe and potable water in the Municipality. As of December 2015, SMWD has total service connection of more than 26,000 households which translates to approximately 150,000 people served. The reduction of the SMWD’s non-revenue water (NRW) is also one of the improvements realized. The record of NRW in 2001 showed that the SMWD was losing water in the range of 37-40%. However, with the effective management plan and effort of the employees, the SMWD was able to minimize the NRW as substantiated by the average of 18% for the year 2009. By December 2015, the SMWD was able to further minimize its NRW by an average of 8.9%. With regard to categorization, the SMWD was initially classified as a ‘Small’ Water District in 1997. SMWD then applied for ‘Average’ category, and was instead approved into a higher category – the ‘Medium’ category, on November 20, 2000. The plantilla for the said category was approved by the Department of Budget and Management (DBM) in February 5, 2003 with 70 career positions. Subsequently, the SMWD applied for ‘Big’ category and was again opportunely approved to a higher category which was the ‘Large’ category, on June 2010. With the onset of Revised Local Water District Manual on Categorization, Re-categorization and Other Related Matters (LWD-MaCRO) per DBM Circular Letter No. 2011-10 dated November 18, 2011, the SMWD is now classified as Category B. SMWD’s new plantilla for Category B was then approved by the DBM in July 3, 2014 with 109 career positions. ENGR. CARLOS N. SANTOS, JR.
Engr. Edgardo E. Dela Torre, Jr. In charge of the functions relative to human resource, MIS, procurement and records. In charge of recording the financial and operational transaction of the SMWD which includes billing, collection and deposits, disbursements, procurement, inventory and taxation as well as preparing of financial reports. In charge of the functions relative to property maintenance and management. Facilitates the accurate billing and posting of customer’s accounts. In charge of the identification, planning and design of projects for the improvement and expansion of the water district’s supply system. In charge of ensuring the efficiency of potable water supply to all concessionaires thru proper handling of civil works, construction projects and regular maintenance of all pipelines. Expected to ensure the efficient delivery of potable water supply to all concessionaires.